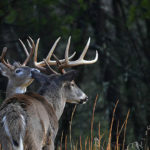 Editor’s Note: This week I’m trying to answer the question everyone asks at this time of year, “What’s the best deer rifle and bullet for me?” I’ll tell you about some of my favorite deer rifles and why. I’ve also included information from the readers of numerous deer-hunting Facebook groups who’ve answered this question for me. Someone may mention your favorite rifle, as well as others you don’t like. However, remember, this is a look at the various rifles preferred by hunters across the country, who hunt different kinds of terrain. You may be surprised at some of the exotic guns mentioned, but also will find interesting the outdoorsmen who have hunted with the same guns their entire lives. 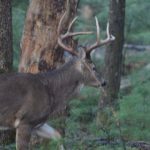 Let me know if this column helps you to decide what deer rifle is best for you or gives you new ideas on a deer-hunting rifle. Comment at john7185@gmail.com. On my first trip to Canada’s Anticosti Island, I took two rifles – my .243 that I borrowed back from my son, John, and my 7mm. I really wanted to shoot my .243, but not knowing the size of the deer we’d be hunting and the distance of the shots I would have to make, I also packed my 7mm. Anticosti Island is a large patch of land rising above the Gulf of St. Lawrence in eastern Quebec, Canada. This island has become famous for its superb white-tailed deer hunting, and at the time of this hunt, we could legally harvest two deer there. Moving through the snow-drenched evergreens, we’d only gone about 50 yards when LeBrun said, “There he is between those two trees.” I brought my gun up. I only could see the buck’s head, antlers and shoulders through the trees. He had his right leg forward, and I aimed a little low behind the shoulder and squeezed the trigger of my .243. The buck jumped and vanished. LeBrun looked at me, frowned and said, “I told you that little pop gun wouldn’t kill these big deer.” I smiled and said, “I guarantee you he’s dead.” When we went to where I had shot the deer, we found a good blood trail that went only about 30 yards before we found my buck piled up. The next morning we went out at first light. About 9:00 am, I saw LeBrun grab his binoculars and whisper, “There’s a good buck across the power line right-of-way, but he’s way too far for you to take a shot. We can’t get close enough to him for you to kill him with your .243.” I looked at LeBrun, smiled and said, “In other words, you’re saying I can’t take this buck.” LeBrun nodded his head, yes. Then I whispered, “Would you mind if I try to take this buck like I was hunting him down home?” LeBrun said, “Yeah, you can try, but you’re not going to take that buck. He’s too far.” I put the .243 on my back, got down on all fours and started crawling toward a little spruce tree about 30 yards from where we were standing. I was pushing snow with my nose. My shoulders and back were the only part of me above that blanket of white. When I arrived at the spruce tree, I looked back at Zappia and LeBrun, and I heard LeBrun whisper, “The deer’s body is behind the tree. He’s feeding on moss on the side of the tree. There’s no way you can take that buck.” I turned around, got in a sitting position and propped the little .243 on the sapling. When I looked at the buck through the scope, he had his neck outstretched. I could see the spot where the neck joined the body, but the rest of the deer was behind some brush. 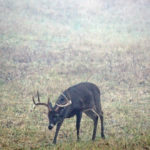 I remembered what John Lanier (see Day 2) had said, “If you shoot for the place where the deer’s neck joins his body, and you aim right in the middle of that spot, you’ll break the deer’s neck and kill him instantly. Or, you’ll miss him completely, and I won’t have to trail him.” I found that magic spot in my scope. When I squeezed the trigger, the deer’s head and neck went out of sight. LeBrun announced, “You missed him.” I explained, “No. He’ll be on the ground, right where he had been standing.” When we arrived at the deer, I looked at his nose, and I saw where the deer had skinned his nose as it dragged down the tree after the shot. The buck had dropped in the same tracks where he had been standing. Don’t get me wrong. I love to shoot my 7mm and my .30-06. But after hunting with a wide range of rifles for a lot of different game, I’ve come to believe that where you place the bullet on the animal you want to take is far more important than the size of the bullet or the caliber of the rifle. What do you think? 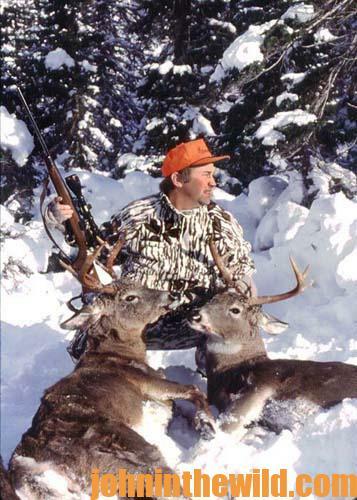 I asked Facebook’s deer hunting groups this question, “In your opinion, what is the best hunting rifle – caliber and make – for taking deer and why?” Here are some of the answers. * Ricky Presley – Out of all the rifles I’ve ever shot, the .25-06 I own is the best/flattest shooting gun I’ve ever shot. It’s amazing how that round performs. * Ricky Pack – .300 Mag and 7mm are a bit overkill, I’ve dropped deer with a .30-30. It’s a great gun. Not saying it’s the best. Just that you don’t need a huge caliber. I dropped a deer last year at 100 yards with my Marlin .30-30, lever action. * Josh Irwin: .30-30s are good guns. Everyone underestimates them. Hornady has changed that for the .30-30 hunters with their ballistic tips. I shoot my Knight Disc rifle green mountain barrel .209 primer stainless bolt action with two white hots and 250 grain SST Hornady ballistic tip that packs a mean punch and loads of knock-down power. * Charles Shepherd – I am very happy with my TC Venture in 7mm-08. Flat enough, low recoil and so far the performance with the Nosler 140 E-tip has been wonderful on deer. I’ve got four down with everything from 40 yards to 220 yards. The handling of the rifle is smooth and the ergonomics for me are just about spot on. I have it topped with a Trijicon Accupower 3-9×40. Couldn’t be happier. 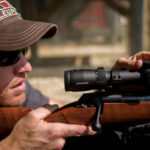 * Jared Witt – .30-06 – I deer hunt with it and shoot coyotes with it. Never had a deer take another step on me. 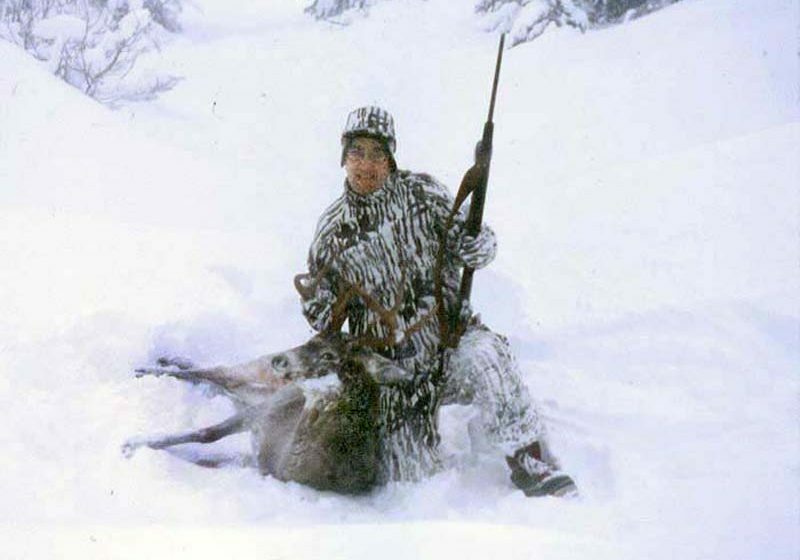 * Jerry Campbell – .30-06, .270 and 7mag – all good with right scope, but you can’t beat a .30-30 for all-around brush thicket, run-and-gun to do the job. Just saw a post with guy and his first kill with pistol. That’s satisfaction to me. So practice with what works best in your core. Happy Hunting. * Trey Perrin – Browning .300 WSM. Instant death; no tracking. Does not require good shot placement. * J Ricky Sizemore – For brushy terrain under 100 yards, 12 gauge shotgun slug. For over 100 yards and open fields, .30-06. You can load the 06 with a 220 gram bullet and shoot through brush, or load it with a 110 gram bullet and shoot out to 500 yards. Most versatile round. * Jordan Whitfield – .243 might not get a pass thru, but that bullet goes in and bounces around and does plenty of damage. * James T. Sentell – Best rifle is the one the shooter can put three holes in an 8-inch paper plate hanging 100 yards away in less than 5 seconds. (You’re not going to do that with a .300 super power burner mag). * Wayne Lackey – I agree. Lots of deer killed with a .30-06, but there are lots of flatter-shooting rifles with plenty of power to kill a deer. The .270 and .25-06 would be better rifles. * Derrick York- I know the gun matters, but a good scope means more to me. * Hoyt Eddie Mintz – Shot placement, if you can’t hit where you aim, gun means nothing. * Bryan Phillips – For me, it depends on where I’m hunting. Open or tight fit. Shot placement for me is right behind the ear in most cases. So, I have used from a .223 to a .300 Win. Doesn’t matter – if they all make a hole where you put them. * James Roberts – The best one is the one that’s most accurate for you. I use a .30-06 myself, and it gets the job done. 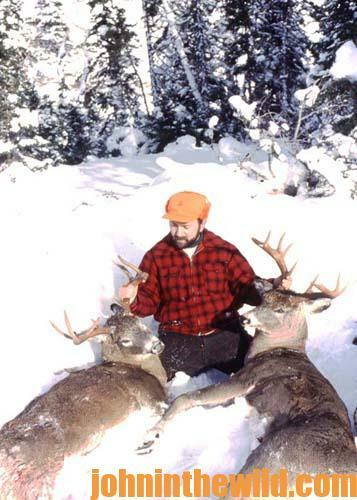 Other hunters may use different calibers to do the same. The main importance of hunting is patience! * Adrian Farley – This guy is gonna have to get a second job with all the different guns he’s got to buy. Just get a good .30-06 bolt action. * Jay Johnson – .30-30 in the woods. Fast on target and fast follow ups. .270 in cutovers or fields. * Terry Snow – I shoot a .30-06, Because I have a ton of match grade .30 caliber ammo. I pull the target bullet and replace it with my hunting bullet and away I go cheaply. Other than that, shoot whatever you’re comfortable with. If you’re familiar, comfortable and practice with your rifle, you’ll kill everything you shoot at if you do your part. And, yes, if you do all this, a good scope is a huge plus. * Chad Norton – Marlin .45-70….unbelievably accurate out to 200 yards. Easy to maneuver in a tree stand or a ground blind. A blast to shoot. * Lewis Lackey – Savage .270 , shooting Remington core lokt ammo 130 grain. I have taken deer over the last 25 years, a lot at well over 200 yards. This gun is flat shooting and has enough knock-down power to leave a good blood trail. Not much tracking here; bullet stays together but mushrooms to the size of a nickel. * Jake Bowman – Browning A-bolt .25-06. Fast, flat shooting, plenty of knock-down power. * Greg Traynor – I like my .308. My typical shots are under 150 yards. It shoots great with enough energy to quickly put down any deer. 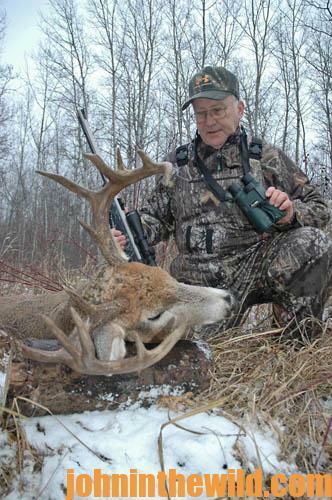 * Bill Reynolds – .264 win Mag – no tracking; excellent for long shots!!! * David Martin – A Bolt II in .280 Rem and .300 WSM. Love those rifles and calibers. * Thorin Ossman – For New York hunting, a Ruger American. .308. * Tracie N TJ Hayes – I love my old .30-06. It’s good for a pretty long shot or up close.. Bullets are easy to find… any sportsman store or Walmart has .30-06 bullets, and they are always priced below most all other caliber bullets. Oh, it’s deadly too, I’ve been shooting it since I was about 11 or 12, and I only remember losing one deer with it. I hardy shoot it nowadays though, I like bowunting better. * Wayne Wiley – Yeah, .30-06 and .270 Win. Shells are the easiest to find and the cheapest! My dad uses a .30-06, and I shoot a .270. They both have killed lots of animals for us! My old 35 Rem. shells are like $35-$40 a box! That’s why I like the .30.06 and the .270! * Brian Moody – Shot a lot of rifles, and my favorite universal round so far for Oklahoma is my Howa 1500 in 6.5 Creedmoor. * Donnie Conway – .25-06 – light, not bad recoil. Flat shooting and long range. Although I don’t shoot one anymore, cause ammo has gotten hard to find and was higher price, so I got rid of it and went to a .223 Bolt Action, AR .243 Bolt Action, .308 Bolt Action and AR. * Matt Mabary – 7mm-08 or .30-06. The .30-06 is the granddaddy of them all. The 7mm-08 has a little less recoil and is very flat shooting. * Cody Bradley – Mine’s a lever action Marlin that’s a family heirloom. Dad killed his first deer with it. I killed my first, and hopefully the cycle will continue with my boys. A million bucks wouldn’t touch that rifle lol. 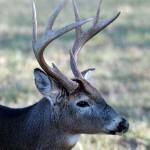 Whitetail Hunting on the BRAIN/Is There a CURE ??? * William J. Stewart – .22-250 or if you like big bore hunting, a .257 Weatherby. * James Wright – Remington Model Seven SS 7mm-08 with Leupold 3.5 x 10 x 50 mm! Because no other rifle or caliber is better! I own and have hunted with almost every make and caliber! Several are about equal! But none are better! * Charles Tinsman – More deer killed with a .30-30 than any other gun. * Hunter Hess – I love my Remington 700 .270 and Encore .25-06. * Lanston Henry – .30-06 Springfield Remington 700 with a Tasco 3-9×40 and 180 grain fusion bullet. Nothing is walking away. Dropped my deer with this. The biggest blood trail I’ve ever seen. * Amos Wilson – Savage Axis .30-06 . It’s a cheap rifle and deadly accurate. I got a nice 8 point with mine. You can go from as low as 110 grain rounds up to 220 grain rounds with the .30-06. * Mike Willingham – Like .223 short Mag. Never lost a deer with it, and it doesn’t tear your meat up. They fall in their tracks. I think big caliber. is overkill. If you shoot them right, they will fall. That’s my opinion. * George Sherrier – I have a 6.5 Creedmoor being built. Can’t wait to find out just how good my long range hunting will be. * Wyatt Ley – Savage .270 with a 120 grain ballistic tip. Hit them in vitals or neck, and you have one dead deer. * Terry Cauley – If your shots are 100 yards or less, .30-30 works great. For shots out to 300-350 yards. .308-3006 or .243. For 500 yard shots, .300 win Mag, 7mm Mag, .270 – 25-06 and most of 6.5 caliber. I like 7mm Mag best. It’s shot placement that really counts. * Derek Kevin – Savage trophy hunter compact in 7mm-08. Light, compact, high quality, 140 grain flat shooting, perfect deer caliber and with a 2-7x scope also great for walking on drives! Sighted in 1.5″ high at 100 yards, and you can shoot deer from 0-250 yards with no holdover correction! Can’t beat it! * Alex Walker – Remington 700 300 Win Mag, 180 Winchester Xp3 or Remingtom Core-Lokt, Nikon Monarch 5.5×16.5×44 DNZ 1 piece mount. Drop anything as far as you can see!!! * Jack Miller: I love my Thompson Center Pro Hunter in the .270. It’s the best shooting gun I have ever owned. * Dewayne Kuykendall – Ruger American 243 – 1) under $400.00, 2) light on recoil, 3) good range of ammo, 4) capable of reaching out past 300 yards, 5) great starter rifle for first time owner/hunters…That’s my opinion. * Lonnie Wrye – Whatever you choose to use and you are happy with. I’ve heard of people who’ve lost deer with just about every caliber. It’s about shot placement more. * Kyle Prondzinski – Yeah, 100% shot placement. You don’t need a .300 or 7mm to shoot deer. Yes, don’t get me wrong I love those guns. They’re awesome. But for deer, they’re a bit overkill. You don’t need anything bigger than a .30-06, and really you don’t even need that. But I do like big guns. * Matt Smith – .270 with 130 grain Winchester ballistic tips. I always hunted with a .270 ever since my dad bought me my first one when I was 11. I’ve never had a deer go more than 10 yards after shooting one. Very flat shooting gun. * Bill Ryan – 700 Rem. BDL. .243. I have taken near 100 deer with a .243. Dewayne Kuykendall stated it great above. Like my .25-06 Rem.700 BDL too. * Tim Lauber – 7mm Mag! They shoot flatter than a .300 and still put em down with one shot. And don’t ruin a lot of meat. Still good for out West elk, mule deer and more! * Warren Burns – I used to have a 7 Mag, and deer would run off every time. They would die, but they would always run off. Tried three different types of ammo with the exact same results. Sold the 7 Mag. * Adam Crowson – I use a Mosin-Nagant, Swedish Mauser and a Mossberg 100 ATR. These calibers range from a 7.62x54R, 6.5x55Swedish and .270win. So that being said, you make up your own mind. * Thomas Honaker – H&R 7mm-08 Remingtom with a139 grain Hornady American whitetail and shoots flat with a lot of knock-down power. * Mandy Burgess – .243 with 95 be.ballistic tip is my fav. It works really well, not too heavy, doesn’t kick, and not overkill. Just sweet all around. If the bullet is placed right, it drops deer in their tracks. Just my thought though. Maybe not everybody’s. I want to thank all of you who responded to my question. I’m sorry that space didn’t allow me to use everyone’s comments. Thanks again for your help. 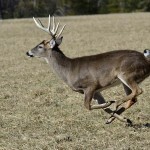 To learn more about deer hunting, go to for John E. Phillips’ Kindle, Create Space and Audible books at johninthewild.com/books/#deer and to www.barnesandnoble.com for Nook books. For a free download on how to make jerky, visit johninthewild.com/free-books. 08/30/2017 Should You Use the 6mm for Deer Hunting? 08/26/2017 Is the Best Deer Rifle High Powered and Comes with a Scope?